During much of the 18th. century, Russia was ruled by women. 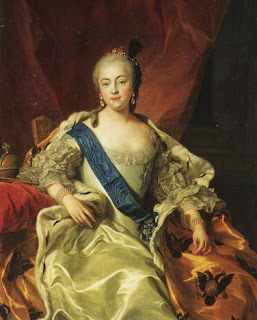 Elizabeth and her successor Catherine II solidified Russia’s position in Europe. Fifteen years after her father, Peter the Great died, her cousin Anna took over the government. She was hated for her policy of high taxes and appointments of Germans to head the government departments. After Anna passed from the scene, Elizabeth rammed through a coup and took over. She reversed Anna’s policies. Her most noteworthy achievements were in foreign affairs. She settled the long disputes with the Scandinavian powers on the Baltic. In the 7 Years War (1754 – 1763) she was on the verge of breaking Prussia’s power but she died. Her successor was a big fan of Prussia’s ruler, Frederick the Great. He pulled out of Elizabeth’s alliance and even joined Frederick. The foundation was laid for the German-Russian conflicts that were to last to World War II. More information: Elizabeth, Catherine the Great.